After diagnosed with hepatoma back in February, my family knew about the hardship my father will go through. The first of it came during this last long week-end (the Nyepi public holiday was this Monday, 03/19). Thu, 03/15, around 16.00. 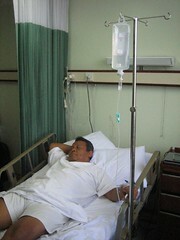 My father was admitted to Medistra Hospital. He was a-okay. In fact, he drove there himself, accompanied by my mother. Something which might affect his blood pressure, rising above his normal levels. He was promptly CT-scanned and wheel chaired to room 402. His blood was also sampled. Thu, 03/15, around 20.30. As everything was normal – my father was being active and upbeat, as usual – my mother and I decided to return home. Fri, 03/16, 6.40. My mother and I were back at the hospital. Not long after, several of our relatives from my father’s side arrived to give support. My aunts from Sukoharjo and Klaten, my uncles from Yogyakarta, all were present. Thanks a million for your support, guys! Oh, my father was given IV fluid and some more blood tests ensued. Fri, 03/16, 9.30. After waiting for the late – literally – doctor, my father was carted to the operating room. My mother, myself, and two of my aunts accompanied him up until its doors. We wished him well and shed few tears there. I was worried because of the extreme pain I know he would go through. He would undergo a TACE, Transcatheter arterial chemoembolization. Basically, a flexible wire was inserted through his thigh up to his liver via his blood vessels. Its purpose was to block the blood lines giving food to the cancer in his liver. Fri, 03/16, 11.15. My father was carted back to his room. The TACE treatment went quite successfully. Unfortunately, not all the blood vessels blocked were isolated only to the cancer. So, some of his healthy liver cells were also affected, causing him more pain than what was supposed to. The pain was evident on his face and constant sweating. I knew that he struggled hard against the pain. He is not one to easily whine about pain and suffering, but the chemotherapy has taken its toll on him. Fri, 03/16, evening. Wendy, Ninna, and her husband, Arif, came to visit. I felt guilty for Wendy because my extended family was having a field day over his thinning hair. *grin* Thanks for the support, guys! Fri, 03/16, all night long. The pain continued. I recall he asked to be given pain relievers twice that night. I stayed at the hospital with my mother and three aunts. I couldn’t bear to see his suffering, so, nearing midnight, I decided to sleep in our car. Sat, 03/17, morning. My father was still in pain. He was given another shot of pain reliever. It helped. He sometimes responded to our chitchat and even joked one or two times. My extended family also came. The room was so crowded that one of the nurses asked some of us to get out of the room to give room for my father. Hey, what do you expect? My father has 9 brothers and sisters. Sat, 03/17, evening. My father was getting better. He can sit normally during dinner – not what you would call a feast, really – and even taken a bath himself. My mother and I stayed at the hospital while other relatives returned to their homes and staying places. Sun, 03/18, morning. My father could move about freely. Well, almost. There was still some pain around the spot on his thigh where the doctors inserted the flexible wire. The doctor who cared for him gave green light for him to return home. But the green light was promptly cancelled due to his high sugar levels in his blood. The doctors decided to give him sugar-control medicines and monitor the effects. A bit later, Miss D came to visit by herself. Her parents could not go because her mother had a cold. It was Miss D’s first encounter with several members of my extended family. Luv u, Hun! You were great! Sun, 03/18, afternoon. The sugar levels dropped to a high normal. The greenlight to go home was given back. My father was eager to go home. Sun, 03/18, 17.00. After settling with the administration desk about the astronomical medical charges – don’t worry, it’s all covered by my father’s medical plan from his old office – we went home. Mon, 03/18, morning. All was normal at home. I’m thankful for it. I was even allowed to go out with Miss D. Woohoo! My father may have won his first battle, but the war is far from over. Pray that you’re still willing to give us support and prayers. Thank you very much to all who supported. Amiiiiin…. :) Yang kedua itu lho yang perlu dijaga. Me too. The scariest part is when the doctor said that the procedure must be repeated within two months and that several of his other patients underwent as much as 8 times before the cancer finally relented. What he said emboldened us to take the shortcut – albeit a bit costly – which is surgical resection in Japan, which has the most advanced technology on liver cancer treatment. This entry was posted on Tuesday, 20 March 2007 at 09:50 and filed under Family Matters. You can follow any responses to this entry through the RSS feed. You can leave a response, or trackback from your own site.